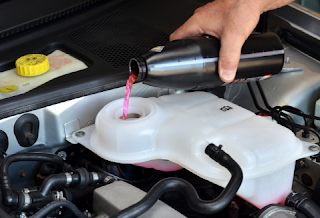 Coolant is a lifeblood of your engine. It keeps your engine cool, as well as preventing freeze-up in the winter; it also keeps your car’s heater working properly. Older cast-iron V-8 engines could often be overheated without much worry of damage. Not true anymore – newer engines with aluminum blocks and heads are very prone to damage from overheating. A single incident of severe overheating can be lethal to a late-model engine. The coolant in your radiator is a combination of distilled water (more on that later) and antifreeze, which is composed of rust inhibitors, alcohol to raise the solution’s freezing temperature, and other compounds that enhance cooling performance. 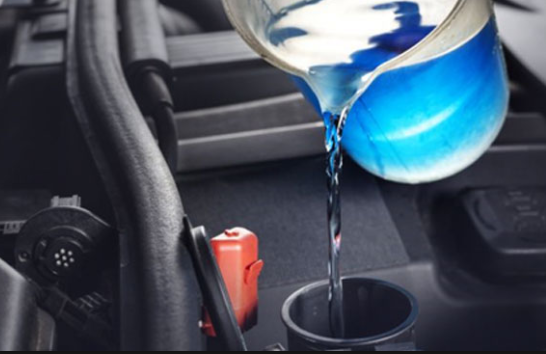 Coolant and antifreeze should be replaced (with a radiator flush) every 2 years or 30k miles; over time, the antifreeze tends to break down and lose its effectiveness. Moreover, your radiator, heater core (which is built like a miniature radiator) and engine all have small passages that can become clogged due to corrosion build-up. The tendency toward corrosion is why tap water should not be used in a radiator…the minerals and other impurities can collect and accelerate corrosion. Even if you have plenty of coolant in the system, a plugged, rusty, corroded radiator passage is a surefire way to overheat an engine. That’s why regular coolant system flushes are so important. A cooling system flush entails forcing fluid through the entire cooling system under pressure, dislodging any corrosion build-up that might be occurring. Remember, your cooling system operates at extremely high temperatures, and that coolant is under pressure. Under no circumstances should you ever remove the radiator cap to check coolant level unless the engine is completely cool – otherwise severe burns could result.